Access to a world class software development team. With the largest applicants reach in Latin America, BairesDev creates teams using only the Top 1% Software Engineers in the IT industry. 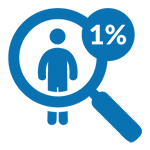 We receive more than 145,000 job applicants each year, and after a very strict interviewing and evaluation process, less than 1% of those applicants are hired. Our proprietary Staffing Suite™ allows us to provide qualified candidates and staff open positions in a matter of days, regardless of the team size or role complexity. How we hire only the Top Talent? We receive over 145,000 applicants each year. After assessing their profile, and using a unique set of algorithms, we assign each candidate to the most appropriate open positions that we have or may have in near future. This step marks the beginning of our rigorous hiring process, which only the Top 1% of candidates will make it through. Once the applicant engineers have been tracked for a position, our system automatically assigns them the pertinent set of 8 to 12 online tests aligned with his/her specific skills along with mandatory English and IQ exams. We have more than 80 different tests that we use depending on the applicant’s desired role and relevant experience. For example, a Java Developer will have to go through (at least) Java, Object Oriented Programming, SQL, Algorithms, Front End, Back End, Advanced IQ, English and other tests depending on the position. If the candidate passes the exams, our HR team conducts a set of interviews with the applicant to evaluate not only their experience but also whether their communication skills, commitment, personality will be a good fit for BairesDev and our clients. For those that successfully pass the HR Interview, a set of more specific written tests are assigned. The written tests are meant to assess both technological savvy and the candidate’s whole approach to tackling creative projects. The final step before being hired is exhaustively conducted by our expert Technical Interviewers. At this stage, very specific questions related to the potential projects in which the candidate might participate are asked, including real-time problem-solving. Those that perform well in this interview are hired and are the Top 1% Software Engineers that will be working with our clients. 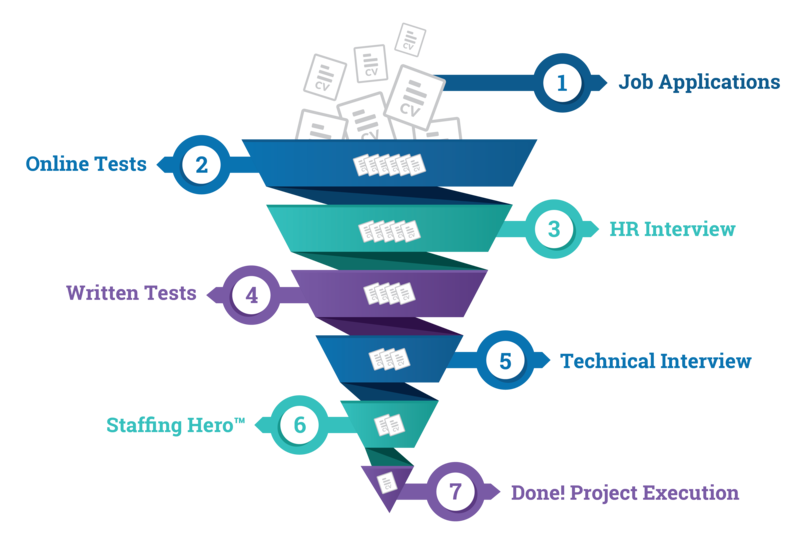 When a new project is requested by our clients or a new set of Software Engineers are needed for an existing project, our Staffing Hero™ system will suggest the most suitable employees to staff and execute those projects. Our Staffing Hero™ combines complex algorithms that include not only technological and profile matches for the projects but past performance, current availability, and clients’ characteristics. Congratulations! Your team is ready to go, and your project is on its way to a successful completion. Your team will be interacting with BairesDev’s team daily: conducting video conferences, having meetings, receiving progress updates, and working in your same time-zone.